This vintage real photo postcard features two young siblings wearing local garb pose for their portrait at an unidentified photography studio. These children are very adorable. The older child is taking a protective position next to her younger sibling. Judging by the card on the younger child’s hat, the kids are dressed for a religious ceremony. This photograph is probably from the 1940’s. The reverse of the photograph indicates that the image was once a resident of a photo album. This vintage real photo postcard features a portrait of a lovely ethnic family. A father and mother and their son and daughter are all wearing dressy clothing for their day at the photographer. The photographer’s studio provided a lovely homey background in which to take this photograph. This postcard image was found in an antique shop in the Texas hill country. It is likely that this family is of Mexican American origin but that hypothesis can not be confirmed. The AZO stamp box indicates that this photo postcard was created sometime between 1910 and 1930. Wow! I stumbled across this vintage photograph in an antique store in the Texas hill country. This great image features two men, who appear to be of Hispanic origin, playing a tune together. These country musicians are playing brass instruments. My best guess is that one of the men is playing a trumpet while the other is playing a tuba. The trumpet player looks quite intense while the tuba player appears to be “groovin”. The men are sharing sheet music which rests on a music stand. The sheet music is titled “The Witmark Folio”. The M Witmark and Sons company was a leading publisher of sheet music for the American “Tin Pan Alley” music industry. The firm was established in New York City in 1886. Marcus Witmark was legally the head of the company but it was actually run by his sons (Isidore, Julius, and Jay). The three sons were aged 14 to 17 when the company was established. The company published the music of many leading composers including George M. Cohan and Victor Herbert. M. Witmark and Sons was purchased by Warner Brothers in 1929. This vintage photograph measures about 6 1/4″ x 5 1/2″. 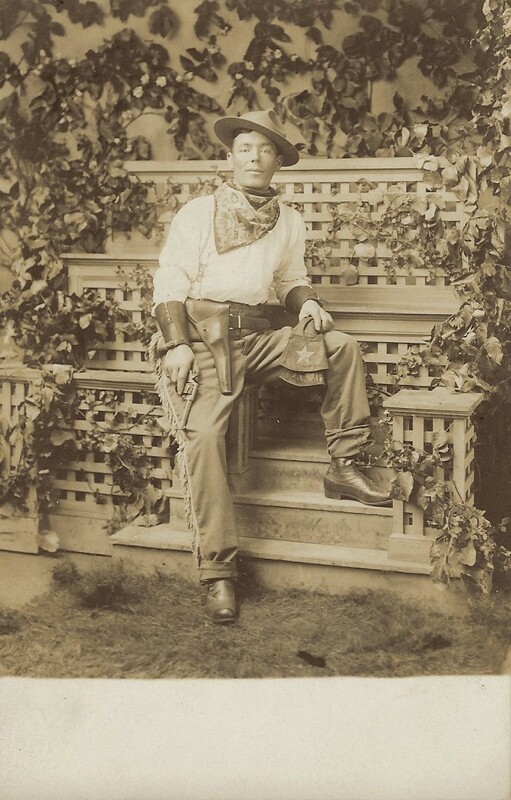 This vintage real photo postcard features a cowboy wearing frilly chaps, a holster, a bandana and a cowboy hat. In one hand he is holding a pistol and in the other he has a pair of gloves decorated with a five point star. The cowpoke in this studio image appears ready to head out on the next cattle drive. The cowboy in this photograph has an ethnic appearance. Perhaps he was Hispanic or Native American. This photograph was taken at the Mazeograph Studio in Portland, Oregon. Charles E. (Cal) Calvert operated his studio between 1906 and 1930. 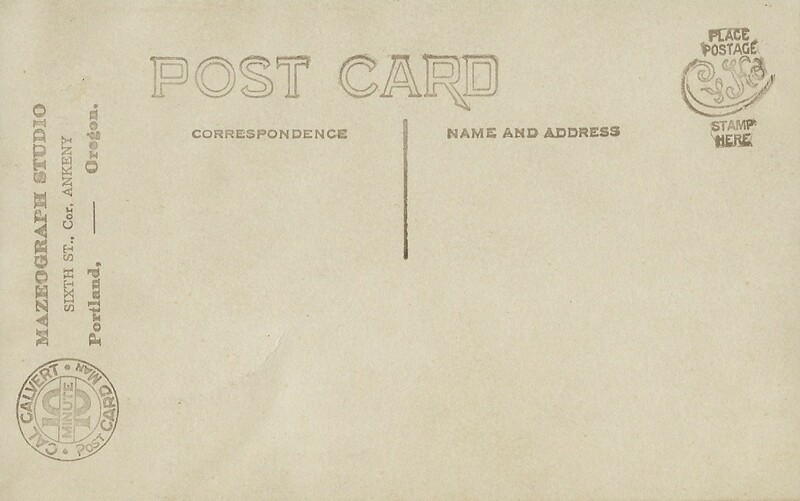 As the advertisement on the reverse of the postcard attests, Calvert’s specialty was creating fast postcards. Studio backdrops and set-ups awaited customers, so they simply had to place themselves in the scene. 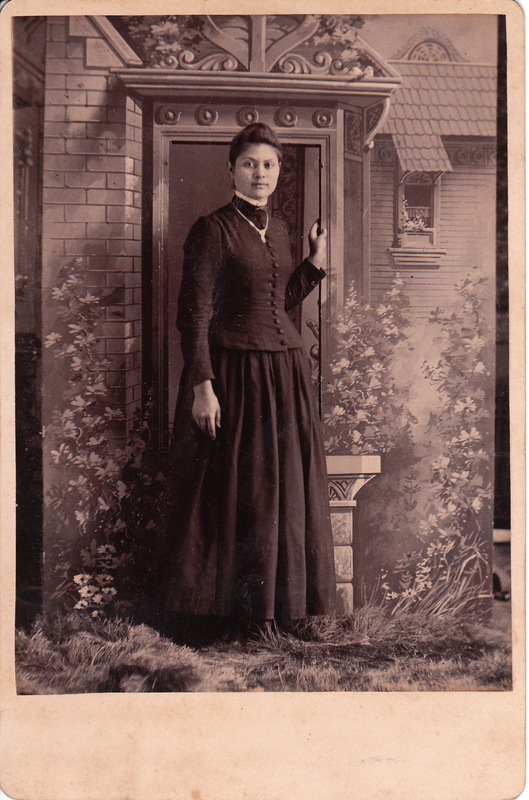 This arrangement coupled with quick development techniques, allowed subjects to be able to procure a postcard image of themselves in less than ten minutes. The postcard itself was made by Cyko and the stamp box indicates that it was produced between 1904 and the 1920’s. This cabinet card features an attractive young woman posing for her photograph in an unknown studio and in front of an unknown photographer. The house is not “The Little House on the Prairie” but the studio backdrop and props compose a terrific replica of a country cottage. Note the faux grass. The woman is wearing a chain necklace. Her skin, eyes and hair are dark. She has an ethnic appearance; possibly Black, Hispanic or Native American. The identity of this pretty young woman is unknown. This Cabinet card pictures, what appears to be, two Native American or possibly African American cowboys wearing their cow punching clothing. The cowboy on the left is wearing a western hat, a neckerchief, and wooly chaps. I do not know what he wearing over his lower arms and wrists. The cowboy on the right has his western hat, neckerchief, and is wearing spurs on his boots. The photographer is Elliott of Marion, Iowa. Marion was established in 1839 and named after popular figure General Marion. The courthouse in Marion was the location of the recruitment of nine full companies which fought for the Union in the Civil War. The area was known as the most patriotic part of Iowa.